Mountain bike the volcano on a Haleakala bike ride. Specialized cycling shoes for sale at West Maui Cycles bike shop in Lahaina. Will a Helmet be included with my bike rental? YES! A helmet is included with all bike rentals from West Maui Cycles. Read more info about helmet laws for bike riding on Maui. Is a lock for my Maui bicycle rental included? YES! Along with a helmet, all West Maui Cycles bike rentals include a bike lock. Do I need to bring my own cycling shoes? Maybe. If you are renting a performance bike and want to wear your own cycling shoes, we recommend you bring your own shoes and pedals. Though we have a huge line of cycling shoes for sale at our bike shop on Maui, we do not offer cycling shoes for rent. Will you change the pedals on my bike rental? Our performance road bike rentals and full suspension mountain bike rentals include changing to your pedals matched to your cleats and cycling shoes. Should I reserve a bike in advance of my cycling vacation on Maui? It depends. Walkins to the bike store in Lahaina are always welcome to choose a bike from the available fleet of bike rentals. To ensure a specific bike is available in the size you want, we recommend making an advance reservation for your Maui bike rental. If you are making plans for the XTerra World Championship at Kapalua, the Cycle to the Sun road ride or other popular organized bike rides on Maui, we strongly encourage making a bike rental reservation before arriving on Maui. Where is the best bike riding on Maui? Maui is fast becoming a popular destination for cycling vacations! The West Maui Loop ride and Road to Hana are among favorite road bike rides for those seeking coastal bike rides with unrivaled spectacular scenery! One of the most challenging road bike climbs on the planet may be conquered with an uphill Haleakala bike ride. Haleakala is the dormant volcano making up most of east and south Maui. With diverse micro climates combined with a nearly endless choice of mountain bike riding trails, riders are easily able to find mountain bike rides ranging from the extreme Skyline trail Haleakala bike ride to cool forest riding on the Makawao Forest Reserve mountain bike trails. Be sure to check out the Maui county bike map and review our past bike blog articles for details and descriptions of more Maui bike rides with bike route maps and suggestions, some with bike ride videos. 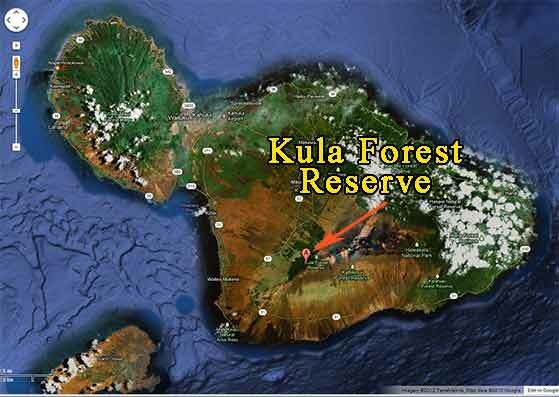 Bike riding on Maui showing a map to the Kula Forest Reserve. If we didn’t answer your specific Maui bike rental question above, please leave a comment below or give us a call at (808)661-9005. We are also active and available on Twitter and Facebook. Let us know your Maui bike question. Already on Maui? Stop by our West Maui bike shop in Lahaina. Browse the vintage bike collection while you talk story with our friendly and helpful staff. West Maui Cycles is a real bike store catering to bike riders and we love to share everything we know about bike riding on Maui. From pros bike riders in need of qualified professional bike mechanics to casual riders looking to discover a new secret beach with comfortable beach cruiser bikes, you’ll find the bike you want along with knowledgeable helpful bike staff at West Maui Cycles in Lahaina. Reserve Maui bike rental today. Check out our beach cruiser bikes, full suspension mountain bikes or HT 29ers and Specialized performance road bike rentals are available.